This adorable tin framed hanging chalkboard is ideal for place holders, bottle labels, party favors and more! Chalkboards are so fun, quick, convenient and have unlimited lifetime use! Not only great to use at events but how perfect for a childs room! The overall size of our mini chalkboard is 3.5" wide by 2.5" long and the actual blackboard surface is 2.75" wide by 1.75" long. 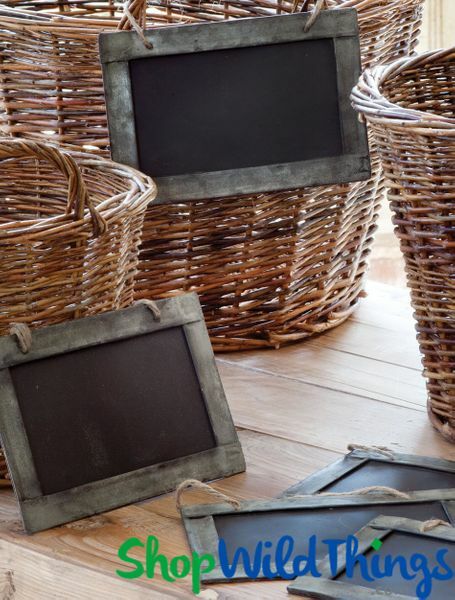 The tin frame has a distressed quality that looks a bit industrial and fits very naturally with the blackboard. A 4" piece of jute twine will securely hold your blackboard in place. The twine is not glued on - it is threaded through slots attached to the frame. The chalk wipes off so easily you can actually use your fingers (but a napkin is probably best!). 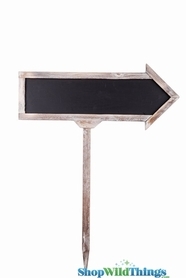 You'll find this mini blackboard so charming and fun that you'll want one for every room and every occasion! Also check out our medium and small sized blackboards! I needed little tin framed blackboards for a company project. These were perfect! I will definitely use again!